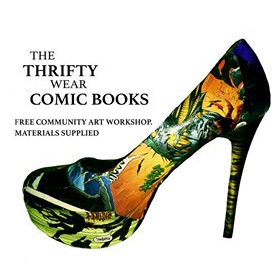 Pop in with your old heels, trainers, boots, or kids shoes and create your own couture fashion. Hastings area. Sheryl Hall presents - Thrifty Couture. Free Community Art Workshop, materials supplied. Rock House, 49-51 Cambridge Road, Hastings, TN34 1DT. Pop in with your old heels, trainers, boots, or kids shoes and create your own couture fashion. Raising awareness and supporting Narcolepsy UK.